I am working on a story and I would like to know if it's possible to detect or recognize mammals, fishes or any other sea creatures that swims in an ocean from an aircraft with our current technology with installed instruments withing an aircraft and not using instruments or sonar that actually enter the water or float on the surface of the water. Aircraft usually flies below Low-level clouds which lie below 6,500 feet (2,000 meters) and used to spot creatures like a group of jelly fish to huge whales. but creatures are mostly huge. and they have far better technology for better resolution. Is that possible with our current technology? If it is only possible in the future, how will it work? I need to know the mechanism or the future tech they could use to detect it. Please talk about its limits on detectability like the depth of visibility and rough sea/smooth sea etc. In my other, similar, question I got answers to detect a submarine. In this one I need answers to detect living creatures. It is already possible, with some limitations. airplane research is costly, invasive and impractical. Large planes cannot be flown closely to the mammals without altering their behavior. Much smaller, quieter drones, on the other hand, are inexpensive and can be flown almost directly overhead. So, as long as your creature, or your pack of creatures, is big enough and you are not flying too high on the sea level, you can observe it from the air. Of course you need to have a calm surface and decently clear water to be able to peek below the surface. If you want to be able to spot a blue whale (30 meters long) from 2000 m height on calm and clean water, your optical system needs to be able to resolve $2 \arctan(15/2000) = 0.46^\circ$. 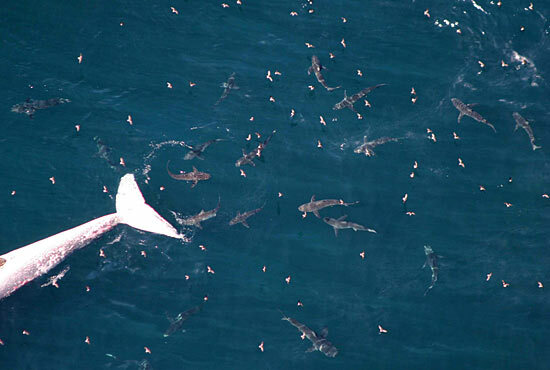 LIDAR is being used to observe lots of different ocean animals from the air. Lidar (also called LIDAR, LiDAR, and LADAR) is a surveying method that measures distance to a target by illuminating the target with pulsed laser light and measuring the reflected pulses with a sensor. Differences in laser return times and wavelengths can then be used to make digital 3-D representations of the target. This group is looking at commercially important fish and plankton schools. Because of the limited penetration depth, LIDAR is most effective when surveying fish that live near the surface. Those that have been successfully surveyed include menhaden , sardines , mackerel, salmon , mullet , capelin , anchovies , herring , squid, and jellyfish. The agreement between lidar results and more traditional echosounder results is good if both instruments cover the same area at the same time, and gets progressively worse is several days elapse. To get this agreement, the lidar data must be thresholded in some fashion to remove the return from background scattering levels. Image scale is established via an independently powered LIDAR/GPS data-logging system recording altitude and GPS location at 1 Hz. Photogrammetric calibration of the camera and lens allowed distortion parameters to be rigorously accounted for during image analysis, via a custom-programmed Graphical User Interface (GUI) running in MATLAB. The datalogger, camera calibration methods and measurement software are adaptable to a wide range of UAV platforms. Mean LIDAR accuracy, measured from 10 bridges 9–39 m above water, was 99.9%. We conducted 136 flights in New Zealand's subantarctic Auckland Islands to measure southern right whales. Mean lengths of 10 individual whales, each photographed between 7 and 15 times, had CVs (SD/mean) ranging from 0.5 to 1.8% (mean = 1.2%). Repeated measurements of a floating reference target showed a mean error of c.1%. Our system is relatively inexpensive, easily put together, produces accurate, repeatable measurements from single vertical images, and hence is applicable to a wide range of ecological questions in marine and terrestrial habitats. The LIDAR of an image will not look like a whale to a person. You have to know how the whale (or squid, or plankton school, or fish) looks with LIDAR and so you need to establish an image base, which is what the first group is doing with fish. LIDAR can be used at night or from an altitude high enough that sentient animals are not aware of you. In the linked articles there is mention of infrared images but I was not clear if they are using infrared LIDAR or if this is an adjunct imaging modality. Source credits NOAA for the diagram. Some quick research will show mostly the same results from other sources... I am including this diagram for its completude and simplicity. 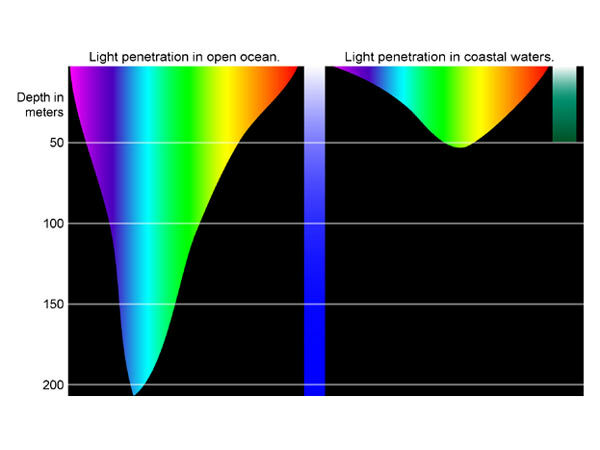 Other wavelengths are not helpful either. Radar and microwave will perform even worse. You will probably need gamma rays to penetrate further than 200 meters, but I don't know if it would even be possible to have a reasonable resolution with that (and I think you want the animals to stay healthy after being detected). Therefore, if you wish to detect animals by looking at them, you will only skim the surface. Given that many of them buggers have evolved some sort of camouflage on their backs (i.e. : orcas, great white sharks), you are in even deeper trouble. You are limited to visual contact if you wish to detect individual animals. If you drop that requirement - that is, if you want to know whether there is life or not, you can go through a different route. Spectography will show you where there is chlorophile and other substances on the surface. Look for the organic ones, they are telltale signs of life. Finally, you can also spot algal blooms and krill clouds from very far (even from space, if you wish to add satellite imagery as a backup), visually or spectographically. Stalk over those areas and you will be more likely to spot beasts from all sizes, from seals to blue whales if you are patient enough. At the moment you can use thermic and normal vision to see fish. Thermic vision only works with warmblood sea animals though. At the moment ships use sonar to detect swarms of fish and other stuff underwater. It is very possible that, within the next 50 years, they make other devices not using sound but maybe other kinds of waves that don't get reflected by the water surface. It's very plausible. 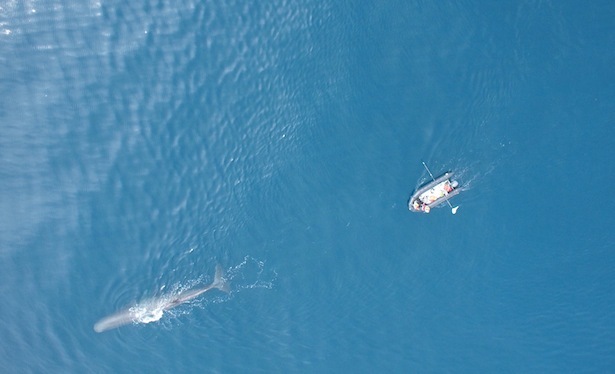 Plausible but more futuristic: sharks scan electromagnetic fields to locate their prey. This might also be realistic in the future. E/M does not penetrate enough to be useful for detecting fish below a few ten meters, as the other answers have stated. I'd like to bring sonic detection back up. There are ways to both induce and measure soundwaves at a distance, so you would not need to mechanically interact (no buoys etc). The technologic system is not available in 2018, but all the components are, so i guess with the right business case it could get developed. For every material, there are certain laser frequencies and local field strengths that induce a material to not simply heat up, but to ablate directly. This is currently used in laser marking. The process of ablation induces a small shockwave in the material, so by timing the ablations, one can introduce any soundwave into a medium. This is currently used in materials science and researched as a way to destroy kidney stones by induced ultrasound. Using more than one site would even introduce the possibility of creating a phased array, giving you the ability of creating directional soundwaves. So now you have a tunable, turnable soundsource (or even sources) on the water. Reading the return signal remotely is also within our technological grasp, lasers, using signal- and wave-interference, are already employed to listen to conversations by reading the vibration of windows. Again, creating more than one listening spot improves reception by the signal processing opportunities that an array offers (directionality, noise supression, localization). Sound-based imaging is only capable of detecting things whose accoustic impedance is markedly different from the surrounding medium, though, so exclusively-soft creatures like jellyfish would not be detectable. Yes, as long as the animal you're looking for is near to the surface. Sound is pretty much the only medium for long-distance detection, and that requires touching the water. Otherwise you'll be using elecro-magnetic radiation in some form, whether visible light, radar or infra-red. Any large animal that swims near the surface can easily be observed from low-flying aircraft. I've participated in aerial censuses of Florida manatees, Mexican sea turtles and bowhead whales in Alaska. The much smaller belugas are even easier to see, as their bright white colors contrast with the dark water. Counting manatees was tricky because the animals were constantly coming up for air, then disappearing into the dark water, making it hard to know exactly how many there were. Commercial fish spotting has long been an industry in Alaska. Not the answer you're looking for? Browse other questions tagged reality-check technology ocean aircraft or ask your own question. What is the most economical barrier that can physically prevent any spaceships from trespassing into Earth?